(Amanda) The trip up the Queensland coast, from Brisbane to Cape York, was the fastest we have ever moved while not on passage. In 6 weeks, we traveled about 1,300 nautical miles. It was long, it was grueling, and I'll be very happy if we never sail like that ever again. There were lots of cool things to see and do and places to go along the coast, however. 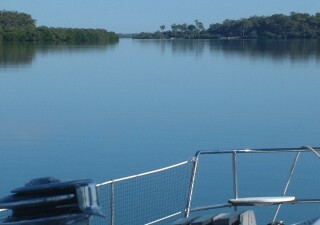 The Great Sandy Strait, inside Fraser Island, was one of these. Fraser Island is the largest sand island in the world, and the strait between it and the mainland is navigable - with good charts, shallow draft, and rising tides. There's a channel, but there just aren't enough markers to show each twist and turn of the channel. Boats go aground on the sand-banks all the time, and just wait for the tide to rise a bit before moving on - preferably in the channel. 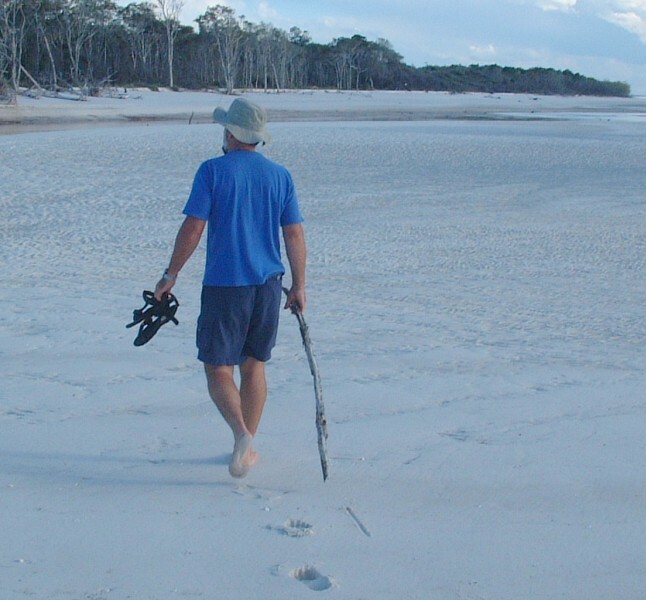 We spent four days in the strait, exploring three different anchorages and walking on Fraser Island. People say dingoes come down to the beach sometimes, but we never saw any. Fraser Island is strangely temperate, with pine forests of all things, not tropical at all. Of course, it's far south of the tropics, but it just felt that it should be more tropical. We found the same thing along much of the coast - islands were tall and covered in rocks and pine forest, and we saw some with names like Pine Islet and Pine Peak Island. We didn't see a palm tree for ages. Once we were in the tropics, we found islands like those we're used to - Low, scrubby sandbanks, sometimes, or high palm-covered craggy islands. Back in the tropics at last! By moving so quickly we missed a lot of places that we normally would have stayed longer. The Whitsunday Islands we visited in 2000, but it would have been nice to see them again (even with all the charter boats around). And Lizard Island was great. We spent 4 days there, hiking, swimming, and having sundowners ashore, but I could have spent many more days checking out the different anchorages around the island. It was also the last place up the coast that we could swim, due to saltwater crocodiles, so I was loathe to leave it in any case. (Sue) Wow, what a trip! Having left Brisbane in mid-May, we knew we had 1,300 miles to cover in about a month if we wanted to be on time to sail across the top of Australia to Darwin by mid-July. We had an unexpected stop in the town of Mooloolaba (don't you love the Australian names?) just a couple days out of Brisbane where we had to have the spinnaker repaired. We got a chance to walk the convoluted streets (they are interspersed with canals and multi-million dollar houses, sort of like southern Florida) and the beautiful long beach with its beach-front boutiques and shops and fish & chips restaurants. We met up with old cruising friends from Panama while there, sharing our 27th wedding anniversary with them at a restaurant in the hills above town. From the Great Sandy Straits (which we all loved) we did one over-night, a few day-hops, then another overnight hitting the Percy and Keppel and southern Whitsunday Islands. Because we had a long distance to go we rarely spent more than one night and so rarely got ashore. Swimming? No, we often arrived too late to want to get into the cool green water. But the islands were beautiful with their rugged shorelines and forested slopes. At Airlie Beach, in the Whitsundays we took a breather and spent a lovely three days with sailing buddies from the Caribbean (in the 1980's). Then we sailed overnight to Townsville and spent a weekend with more sailing buddies from the 1980's. No tourism, just lots of time talking and visiting. 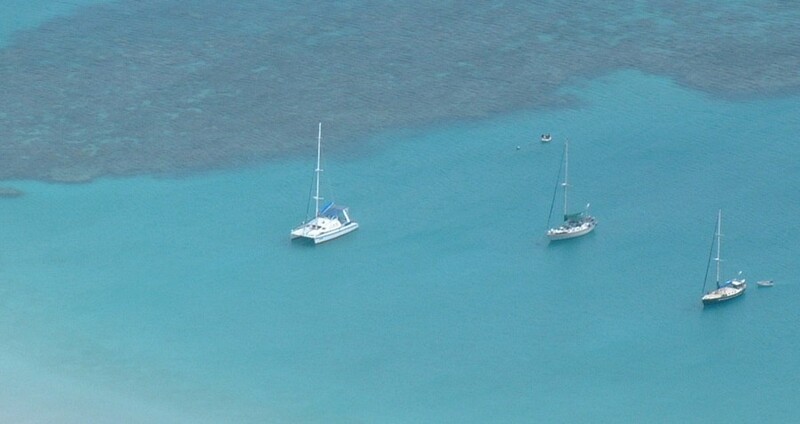 We made the trip from Townsville north to Lizard Island in 6 long day-sails. By now it was mid-June, and we were only half-way up the Coral Coast! We stopped at the north end of majestic Hinchinbrook Island and then at Mourilyan Harbor which is a raw sugar loading port in the middle of sugar cane land. We spent one night in Cairns in the river where we turned and twisted with the tidal changes, then sailed offshore to stop at Low Islets and Hope Island before dropping the hook for 5 nights at Lizard Island. 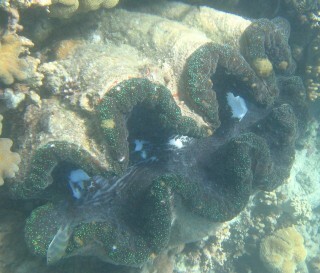 One of many giant clams over 1m long! Lizard Island is a National Park, and also home to a very expensive resort with its own landing strip. Luckily our anchorage was around the corner from the resort, so we yachties had a feeling of having the place to ourselves. I loved the snorkeling here - a shallow reef lies just beside the anchorage and I could just swim over whenever I wanted. 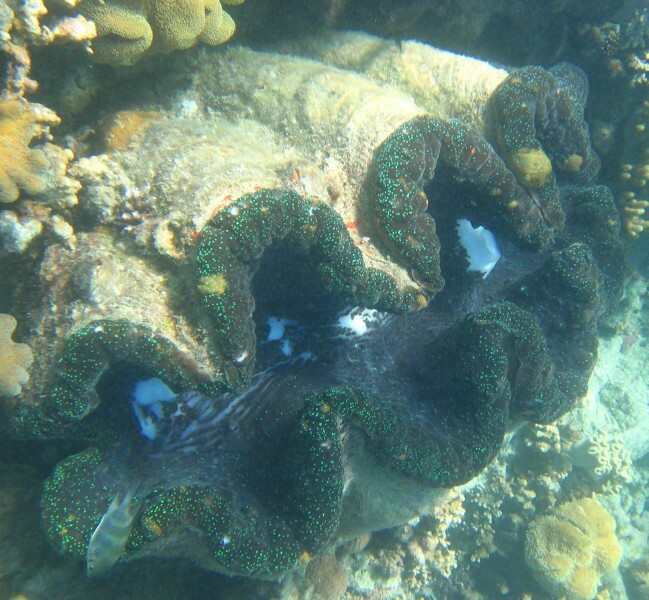 I found numerous new fish species (all identified from our great reef fish ID book), a lovely nudibranch, and tons (literally) of giant clams -- the kind that are 5' (1.5m) across! We also swam with many rays, a huge live baler snail, and both white tip and black tip reef sharks. With so little time, and with all the heavy winds we did not go scuba diving, but the snorkeling was fantastic. (Jon) I actually enjoyed this part of the trip. Yes, we went a bit faster than I would have liked, but we saw a lot of fun terrain as well. The wind was a bit light for the first part of the trip, requiring us to motor more than I like, but that allowed us to explore, for instance, the Great Sandy Strait inside Fraser Island. If the wind had been fair, we would have sailed around Fraser and skipped the straits entirely. In northern Queensland the wind more than made up for its earlier calms - blowing at 25-30 knots from the southeast more or less continuously from the Whitsunday Islands north. This gave us some of our fastest sailing times yet, often averaging in excess of 8 knots for hours at a time and surfing at 12-15 knots. Good fun! It also allowed us to put in some impressive miles during daylight hours, like leaving Lizard Island and sailing 85 miles to the Flinders Group. Although we were actually the last boat to leave Lizard Island that day, we were the only ones to catch fish (actually, we caught 2!) 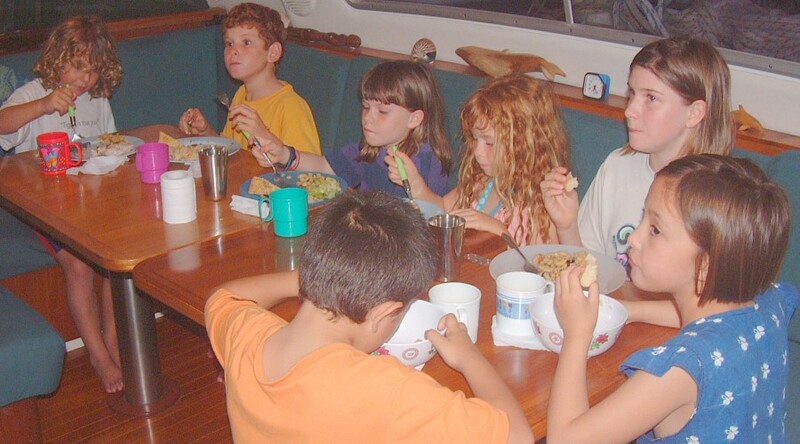 so even after sailing 85 miles, we got to host 13 others for a huge pot-luck feast on Ocelot. Ah, the joys of cruising - we love having a party-boat! My favorite places were probably Lizard Island and Margaret Bay. Lizard Island had lovely snorkeling on the reef just behind Ocelot - about the only place we could snorkel along the entire Queensland coast. We hiked up 1,000' (300m) and got great views from the top of "Cook's Look", the hill that dominates the anchorage. We reconnected with old friends here and made several new ones, having sundowners together on the beach and 'discovering' the old treasure chest from the HMS Pandora (which contained a guest-book with an entry from another catamaran named Ocelot!). We only stayed at Margaret Bay for 2 nights, but they were delightfully restful after racing up the coast day after day. I went for a fun walk across the peninsula on the 'blue trail' (so named because it's marked with bits of blue plastic) to checkout all the flotsam that had blown up on the windward side. I also found some wonderful fresh rock-oysters, which Amanda crumbed and fried up into a delicious dinner, very rich and filling. I talked to some of the locals on the beach and found that one of the big "fishing" boats was actually a lobster boat. The boss wasn't aboard and the crew were happy to sell us lobsters at US$2/lb (A$5/kg). Although this is an excellent price, our freezer was already so full that we could only buy 2, one for right away and one for the freezer. Each tail was so big that they lasted us for about 3 meals. Yum!